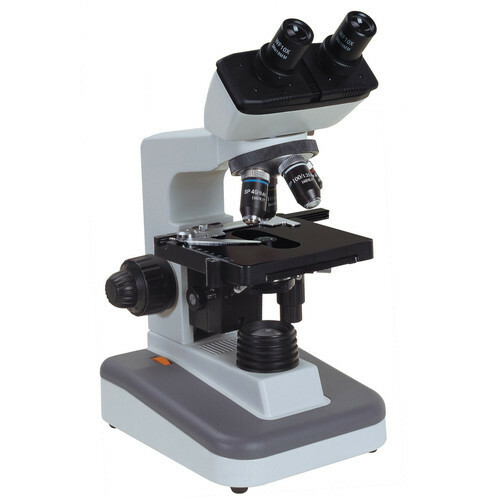 Medical Microscopes is a straight tube monocular research microscope. The body is inclined upto 90° with separate coarse and graduated fine adjustments reading to .002 mm. Triple revolving nose-piece, double lens condenser Numerical Aperture of 1.2 with iris-diaphragm and rack-n-pinion adjustment. Fixed stage with detachable mechanical stage, sub-stage plano-concave reflecting mirror inter-changeable with sub-stage microscope lamp. It is available with fixed mechanical stage, export quality, as per ISI specifications. Supplied in a thermocol box & then wooden box.